You figured the aftermath of the Extreme Rules pay-per-view would be “must-see” television on SmackDown Live. With Jeff Hardy demanding a rematch for the United States Title with Shinsuke Nakamura and a potential confrontation with Randy Orton, the show was very much something I was looking forward to. Let’s not forget WWE still had to wade through the waters of A.J. Styles’ win over Rusev. Would the company continue to book this feud moving forward? There was Carmella and her stooge James Ellsworth and the Asuka “situation.” Would the Empress of Tomorrow exact her revenge? And if that wasn’t enough, Daniel Bryan has officially signed his new deal with WWE, which means he could be booked as a contender for Styles’ WWE Title. Where did The Miz fit in all of this, while he was busy playing softball during the MLB All-Star festivities and missed the show on Sunday night? I waited anxiously for answers. Was I satisfied with the results? No exactly. Here are a few thoughts about SmackDown Live. The two superstars meet for the first time in WWE and does well for himself. The two crossed paths in Japan, renewing an old rivalry. The former NXT star has shown in recent weeks he could be part of the blue brand’s title picture. Almas was able to answer the WWE champion’s arsenal. If WWE is going to push Almas toward the main event picture, this was the showcase he needed. Almas may have submitted to the calf crusher, but this is a feud I would love to see moving forward. It also remains to be seen when WWE may book Styles to finally drop the company title. The Demise of Rusev Day? More like the beginning of the end of the relationship between Rusev and Aiden English. After watching the exchange between English and Lana, discussing how bad Rusev’s sidekick felt about costing him the WWE Title at Extreme Rules, I hope this does not lead to a confrontation between both performers. This would be a huge blow to Rusev’s chance to remain in the main event picture. It may also put an end to the “Rusev Day” phenomenon. While I am huge fan of Lynch, maybe even a slight crush on the Irish lass, the continual weekly bouts with Lynch and Sonya Deville have to stop. There is no movement in the women’s division. If anything, moving Sasha Banks to Tuesday nights might be the best thing for this division while Charlotte Flair is still out of action. Now, Lynch sets her sights on Carmella and the SmackDown Women’s Title. I love Paige. Leave it to the SmackDown Live general manager to stir the pot. Lynch gets her shot at Carmella in a non-title match. If she beats the champion, she gets another match at SummerSlam. It makes you wonder what the heck the company is doing with Asuka. Seriously! Dillinger is a classic example of moving to the main roster too soon. Joe should be part of the main event picture. You have to wonder when that might happen as WWE has yet to fully push the wild Samoan. If Joe is not used effectively, where he deserves a chance to face Styles (see a theme here?) but his health and a crowded title picture may screw him out of a match. The Miz Eulogizes Team Hell No! The best part of Tuesday nights is the appearance of the “A-Lister.” Offering a eulogy for the demise of Daniel Bryan and Kane, who suffered a broken ankle in the loss to the Bludgeon Brothers was class Miz. Oh, and congratulations on winning the MVP of the celebrity softball game on Monday night. Sorry, back to the moment at hand. We even got an N’Sync reference which was classic. The Miz remains the class of Tuesday nights. After proclaiming Bryan’s career is dead, you know what happens next. The setup for SummerSlam has begun. There was a time when Eric Young was one of the best in the business and one of the more underrated wrestlers. Now, he is the leader of Sanity. I’m not sure if I like this faction, but they are growing on me. Kofi Kingston could be part of the main event picture, but he is mired in the current situation with The New Day. I’m still waiting for WWE to dissolve this trio and give Kingston, Big E and Xavier Woods their own angles. The match between Kingston and Young could be a solid mid card feud, but that won’t happen. A wheel barrow neck breaker gives Young the win. In the opening segment, Hardy said he was BROKEN because he did not have the United States Title around his waist and invoked his return title match clause. It was a good match, but not great. Hardy takes the fight to the champion immediately. But this match slows down as expected. Nakamura continues to play the role of villain well, getting heat from the fans in attendance (who were mostly quiet until the Bryan-Miz segment). I’m curious what this match would be like if Hardy was healthy. He admitted he has been banged up for some time prior to the Extreme Rules pay-per-view. Insert Randy Orton. The Viper beats the hell out Hardy until he defends himself. Ultimately, Orton stakes his claim as the top heel on Tuesday nights. WWE Possibly Doing an All Women PPV? Yes, Please! “He must differentiate himself from the old Bray Wyatt in some capacity, or else the character will be doomed to fail.” Do you agree? Bray Wyatt is back in WWE in a whole new way, and Kevin is on board to see this continue over the old obsessive Bray Wyatt. There’s a familiar sinister force permeating the walls of the WWE. 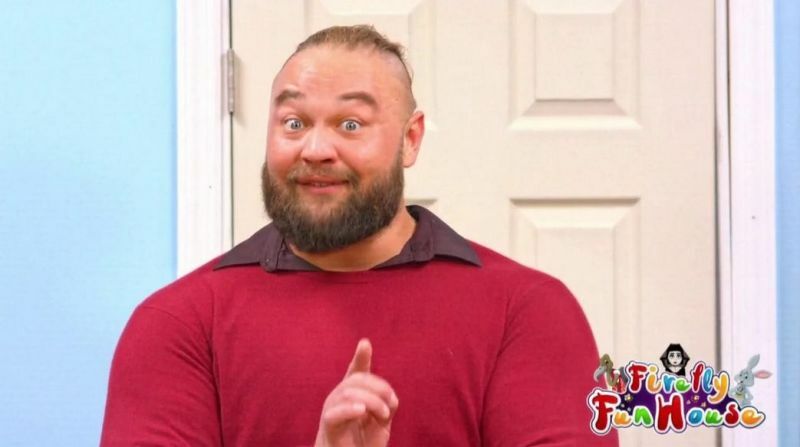 Bray Wyatt is back, and this time around he’s a…children’s TV show host? Yeah, you’ve read that correctly. Bray Wyatt’s newest gimmick is that of the host of the “Firefly Fun House,” featuring a doll, a buzzard, and the man himself. After weeks of creepy vignettes showing the buzzard and the doll, we finally got a taste of Bray Wyatt in his new role on Monday night. Wyatt introduced us to his new friends, atoned for years of being a bad man, and symbolically ended his former demonic self with a chainsaw. All that is a lot to take in. It was wacky, it was bizarre, and it was downright goofy. And BRILLIANT. I ate this segment up, and took to Twitter to pronounce its brilliance immediately after I finished watching it. I know it took the majority of people a couple re-watches to come around on it, but I was on board with this version of Bray Wyatt from the jump. Let’s face it, Wyatt was in desperate need of a fresh look and character, and boy, did he get it. Before disappearing from WWE television last year, Wyatt had been treading deep water being stuck with Matt Hardy, and frankly, he had been in trouble dating back to the WrestleMania 33 loss of his WWE Championship to Randy Orton in a subpar showing. That was back in 2017. Now, in the year 2019, we’re finally getting to see something new out of Wyatt, and it couldn’t come at a better time. Now, the question remains: where will he go? We’ve just had a Superstar Shake-Up, what seemed like an appropriate time to sort out Wyatt’s return, but that ship has sailed. Is the host of the Firefly Fun House headed back to RAW, where he was before disappearing? Or is a return to Smackdown in order for Wyatt, where he ascended to the ranks of world champion back in 2017? It’s difficult, because we still don’t really know what Wyatt is supposed to be. Is he still a bad guy,or is he some kind of demented wannabe hero? I think a character like this would thrive on RAW, but if Wyatt’s still going to be performing as a heel, then he might do better on Smackdown, a show that needs another heel or two. Personally, I don’t see Wyatt as a heel in this character. He’s more psychopath than ever before, but I still don’t see him as a bad guy, but rather as a crazed man trying to make amends for his past wrongdoings. He could instantly become the most interesting character on WWE TV, and in my mind, he’s already there with one segment. Imagine how hot he’ll be with a few more vignettes? But the thing that intrigues me most is what he’s going to look like in the ring? Is he going to wrestle in his khaki slacks and his Mr. Rogers sweater? Is he still going to use the End of Days as his finisher? What new wrinkles is he going to add to his entrance, to his moveset, to his overall character? HE MUST differentiate himself from the old Bray Wyatt in some capacity, or else the character will be doomed to fail. People had gotten tired of the same old shtick for five years, and were yearning for something different. Well, now different is here. But it will all be for naught if Wyatt still acts the same and wrestles the same, we need to see some change desperately. I expect to see more of this new, nutjob Bray Wyatt on RAW next week, and I can’t wait for it. This could be a real game-changer. NXT was loaded with action this week–how did it land for you? Tiffany takes her Takes to Full Sail University and WWE NXT today, featuring Johnny Gargano vs Roderick Strong and more! So, time for OG NXT and Johnny Gargano will face Roderick Strong, but will Undisputed Era stand together or will a jealous Cole wreak havoc? I think we all figured when Gargano chose Roderick Strong as his UE opponent that Cole wasn’t going to be happy, and we’ve all seen definite signs of dissent in the Undisputed Era ranks, but I was honestly surprised by how this match ended. Cole vs Riddle promises to be great. I can’t stand Matt Riddle, but him pointing out that Cole was jealous was perfect. Gargano vs Strong was every bit as great as it promised. Strong’s a great athlete and letting him show that off in this match was a great move. Having Cole accidentally cost Strong the match and having Riddle come in to help Gargano was the perfect amount of chaos to end the match while protecting everyone involved. I don’t know what next week will hold for Undisputed Era, but Strong basically telling UE to f**k off after the loss isn’t a good tiding. I have a question: Is Jaxson Ryker the only competitor in Forgotten Sons? Seriously, when is the last time Blake and Cutler had matches? Don’t get me wrong, Ryker is a great, albeit psychopathic, competitor, but I’m a little tired of him being the only member of Forgotten Sons competing. The match with Carrillo was fantastic, even if Carrillo had a little trouble getting started. The Double Countout was a smart move to protect both guys, but I loved thorough line of having Oney Lorcan, now on 205 Live with Humberto Carrillo, and Danny Burch come to Carrillo’s rescue and keep Forgotten Sons from completely destroying him. This should be a fun feud. So it seems like Candice LeRae is being groomed to take the belt off of Shayna Baszler if this match was anything to go by. I love Aliyah and Vanessa Borne, but I was disappointed by this match because it became clear very quickly that the whole point of the match was to make Candice look stronger when she got a pretty easy pin on Vanessa Borne. It’s nothing against Candice, but I hated seeing Borne Bougie getting sacrificed like that. I’m not sure what WWE is thinking, but if you want to keep Shayna Baszler looking like a badass, DON’T have her constantly getting cheap shots on anyone she deems a threat, whether they are or not. She doesn’t look like an unstoppable badass, she looks like a punk, which is a disservice to her. Plus having Shafir and Duke being her lackeys hurts them too. I APPLAUDED Mia Yim’s promo, especially her calling out Biance Belair’s constant insistence that she was still undefeated, even though she’s lost to Baszler twice, for the nonsense that it is. I’m totally behind Yim getting another shot at Baszler, especially since Belair didn’t have to earn her second chance while Yim hasn’t gotten another one. William Regal had a hell of a career but, in my opinion, he’s at his best as an authority figure and I’m glad he’s loosened up from his days as the strait-laced Commissioner of WWF in 2001. I love Ohno demanding his…right to try out the shiny new NXT toys and I have a feeling he’ll regret demanding a shot at KUSHIDA, which is probably why Regal gave it to him. Sounds fun. 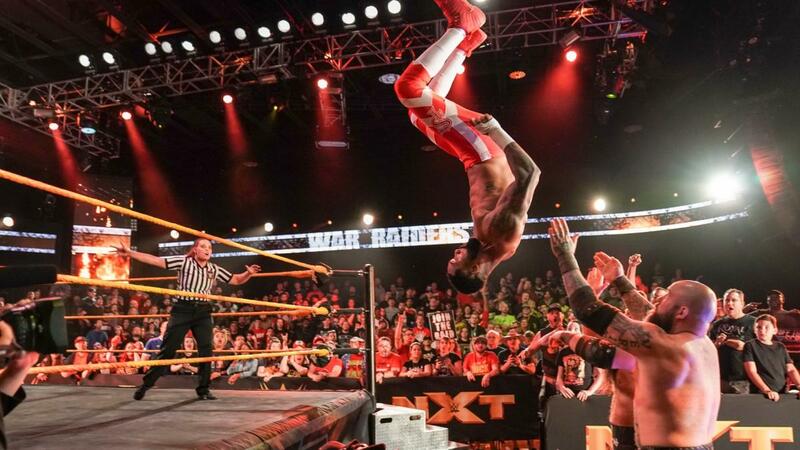 I’m still puzzled as to why Street Profits got a shot at the NXT Tag Champions, whatever they’re called this week, but the match was fantastic. Dawkins and Ford did the smart thing by getting the jump on Rowe/Erik and Hanson/Ivar (I honestly am not sure which Viking name goes with whom, I’m just guessing), but it was for naught because the Nordic dudes got themselves together and absolutely thrashed the Profits, but the Profits definitely proved that they belong in the Tag Title picture. Great episode of NXT! Much like NXT UK, the matches and segments all had a purpose and were pretty good. The disintegration of Undisputed Era seems to be moving much faster than the first ending of the Shield and I’m a little confused as to why. Undisputed Era hasn’t been called up to RAW or SmackDown, so I’m not sure why there seems to be a rush on breaking them up. Granted, having Cole ‘accidentally’ costing Strong the match and his clear jealousy of Strong getting the first shot at Gargano could be leading to Strong breaking off and feuding with Cole, but it’s not clear where Fish and O’Reilly will end up in this. Well, that is it for Tiffany’s Takes for this week! Next week, we’ll be looking Week 2 out of the 2019 Superstar Shake Up and see how RAW and SmackDown will deal with the fallout of this week!